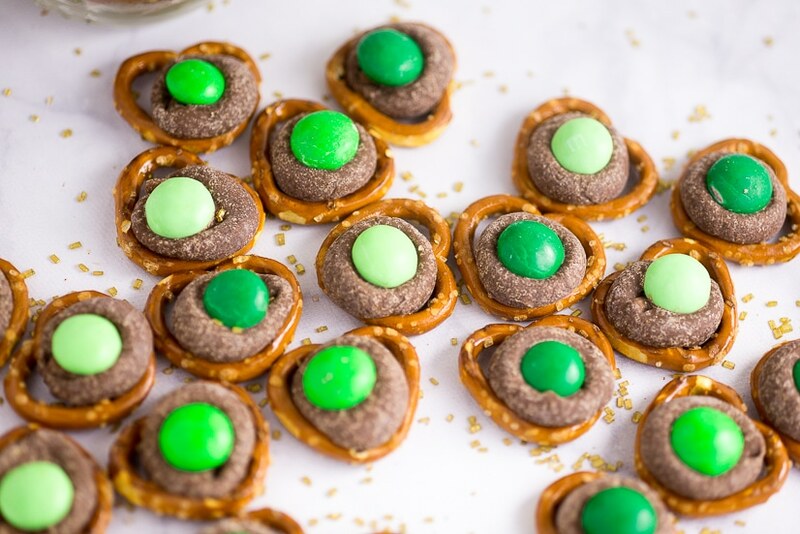 Quick and easy, these Mint Chocolate Pretzel Bites, with just 3 ingredients, make a festive sweet and salty treat perfect for St Patrick’s Day! Simplicity is best in my life these days. I want to make cute, homemade treats, but if I do they need to be quick and easy. And of course, delicious. 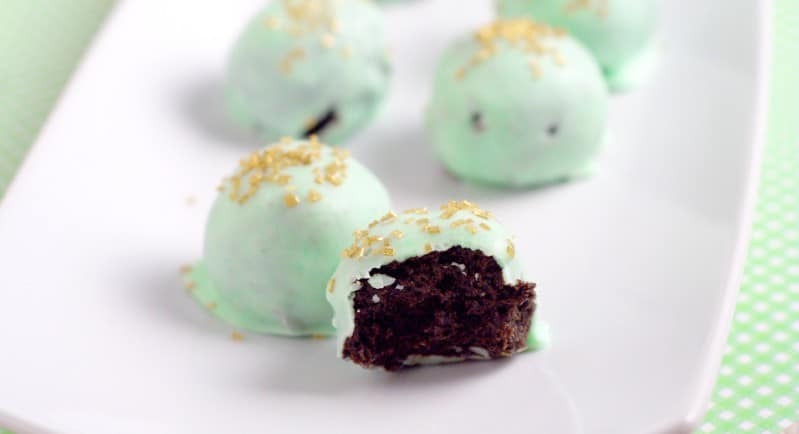 Like these Mint Chocolate Pretzel Bites. Just 3 ingredients, and you can make a whole batch in less than 15 minutes, especially if you have little helpers that will help you unwrap your Hershey’s Kisses. 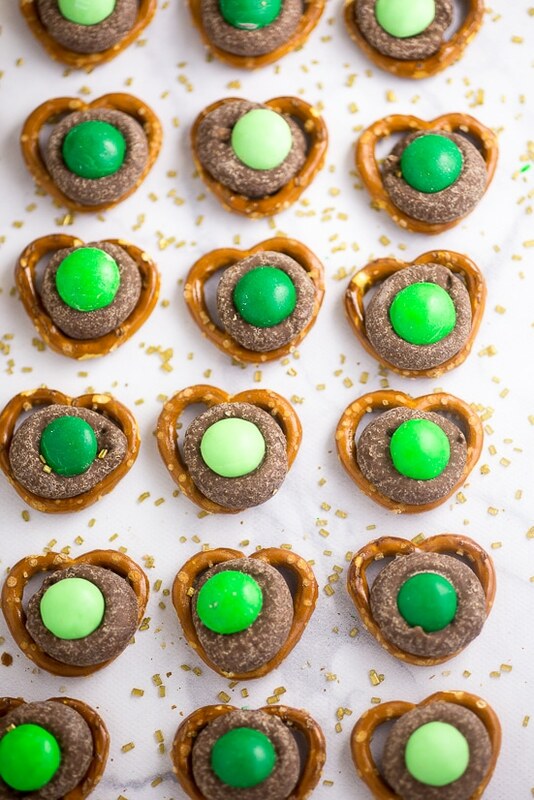 A classic sweet chocolate and salty pretzel combination, topped with a festive green mint M&M makes these Mint Chocolate Pretzel Bites yummy and festive for St Patrick’s Day. We plan on bringing a batch of these to share at our preschool party, but it would also be a cute gift if you put it in a mason jar and tied a gold ribbon around it. To make these, I used my silicone mat on a baking, which worked perfectly. No sticking at all. I actually got my mat this past December to make all of my Christmas cookies. I bought the name brand Silpat and also an Amazon Basics version, and they both work the same. Love them both. But, I’d recommend grabbing these Amazon Basics silicone mats because they come in a set of two for less than the price of one Silpat. MUCH better deal! All of these will fit on a baker’s half sheet, like this one. 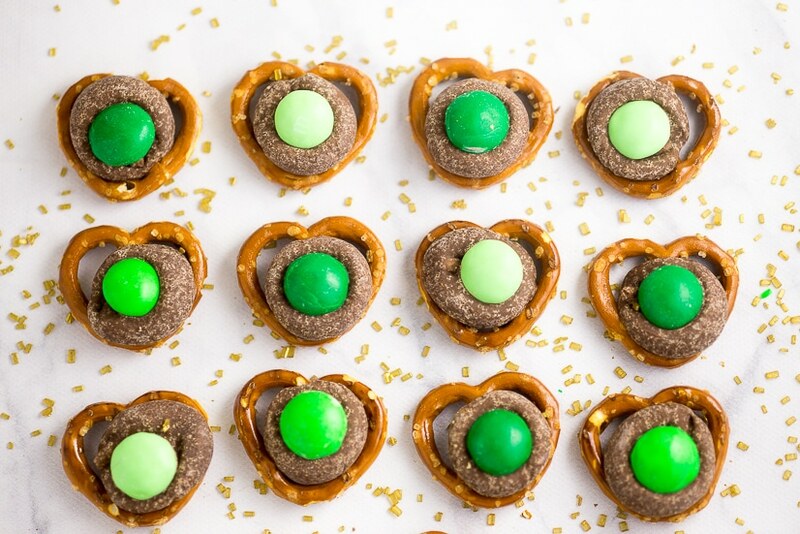 Quick and easy, these Mint Chocolate Pretzel Bites with just 3 ingredients, make a festive sweet and salty treat perfect for St Patrick's Day! Line baking sheet with parchment paper or a silicone baking mat. Place pretzels on the baking sheet. Unwrap and place a Hershey's Kiss on each pretzel. Place a 300 oven for 1-3 minutes, checking after each minute so the chocolate doesn't burn. While the chocolate is melting, prepare the M&M's so you can move quickly when they're removed from the oven. Remove pretzels from oven and carefully place an M&M on each one. The Kiss should flatten when you press the M&M onto it. If it's not flattening, place the pretzels back in the oven for an additional 30 seconds to 1 minute. Place in the refrigerator for about 10-30 minutes, until completely cooled and set. Store in a cool dry place in an airtight container or baggy. 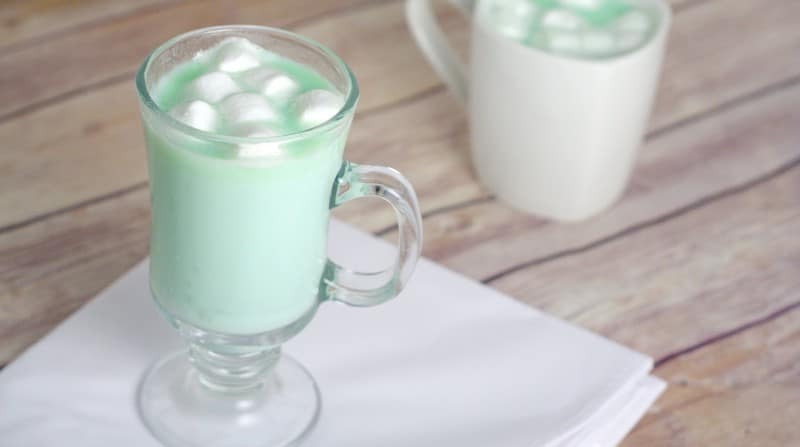 Did you make this recipe?I love seeing your creations. Snap a quick photo and mention @TheGraciousWife or tag #thegraciouswife on Instagram! Leave a STAR rating below! 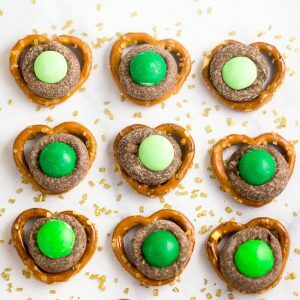 Did you like this Mint Chocolate Pretzel Bites recipe? 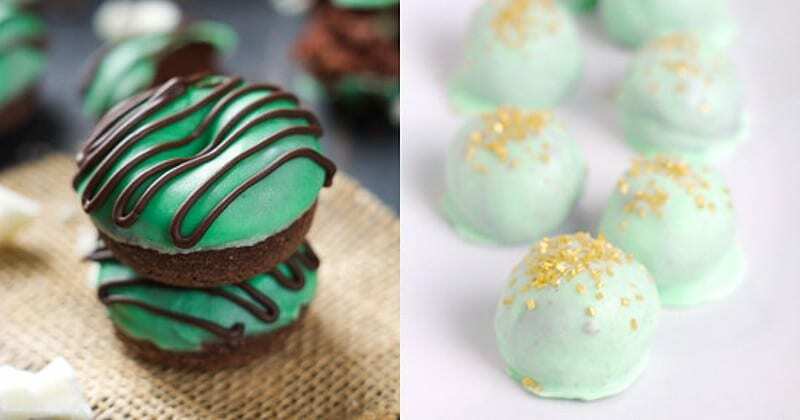 Find more on my St Patrick’s Day and Dessert boards on Pinterest! Join our newsletter to get new recipes, tips, tricks, and tutorials every week!